This picture was shot with a Canon 17mm lens on 35mm Velvia. There are plenty of corrections to be made, but I want only to show how a shot taken at an awkward-looking angle can be changed to appear in "normal" perspective again. If this can be done, I think there's a big advantage in using a very wide-angle lens to get everything you want into the picture (sometimes you don't have enough room, sometimes the horse you're riding on is too nervous and you get what you can) and then correcting back to a regular point of view. to get the verticals, horizontals and parallels right and then rescaling vertically because after correcting angles the shot looks flattened. The key of the game is "make it look natural." The skew command is an option in the Photoshop Edit>Transform menu. Pulling the image corners modifies angular scale (use it to make lines parallel), and moving the middle points of the sides of the picture changes the angles. Better to try it—it's difficult to make a short explanation. This is far easier in terms of the picture not falling apart when resolution is higher (in this case, if you print big enough, the grain is clearly elongated), and when you don't crop too tight when shooting the original, because the skewing brings some of the corners in, and when you reframe and crop you lose some surrounding (I'd like some more foreground in this picture to work with). When done sensibly, especially in city landscapes, this makes a huge impact in perception; things look a lot more balanced and less nervous to me. This picture is quite extreme, mostly because the lens angle of view and the taking angle, but I think it works as an example. It's obviously a matter of tastes, but the results are very interesting. A useful trick, but another thing to bear in mind is that it is like tilting the enlarging easel or using rear tilt and swing on a view camera in that it can only make the image rectilinear in one plane at a time. If you want to photograph something with objects in several planes and have them all square, and you don't have a PC lens or view camera with rise/fall movements, then the trick is to level the camera on a tripod ideally and set it up so the film and lens plane are parallel to the surfaces you want to be square, use a wide enough lens to include everything you want to appear in the image, and then crop out the excess at the printing stage. Of course cropping has its downsides, but it's up to you to decide which is more important in any given photograph--resolution or perspective. Funny how everyone has their own individual way of doing things in Photoshop - (in PS CS2) I'd go to Filter\Distort\Lens Correction to fix perspective. The key to success is realising that this will be necessary at the time the photo is taken and moving back to allow room around the subject. Photoshop CS2's Transform facilities are fine for many subjects, such as this. But CS2's Distort > Len Correction facility is much better for most rectilinear subjects, such as buildings. It produces a better perspective adjustment with less compression and general collateral disruption. It also offers more precision, rather than Transfom's mouse-limited manipulations. Well, I'll have to take another look at it, but being all these linear transformations, the thing with perspective or lens correction tools in photoshop is that they provide correction on one plane and at controlled angles (angles of view, not image corner angles). The thing about controlling every actual image corner angle and position and side length and displacement independantly is I feel I have more control in this mode. The 3D conceptual view of those tools is easier to understand visually but more constrained in my opinion than free flat transformation. Oh, aside from the tech stuff, did anyone like the picture? Oh, please, let's not turn this into one of those "didja like my picture?" forums ... Before you know it, we'll all be offering to crop it differently, etc. (hmm, didn't I read a parody of such exchanges on this very blog?). "Oh, aside from the tech stuff, did anyone like the picture?" I actually liked the "uncorrected" version better than the "corrected". 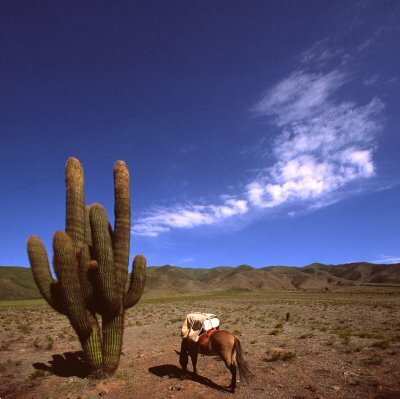 The cactus' leaning created a relationship with both the mule and the cloud. 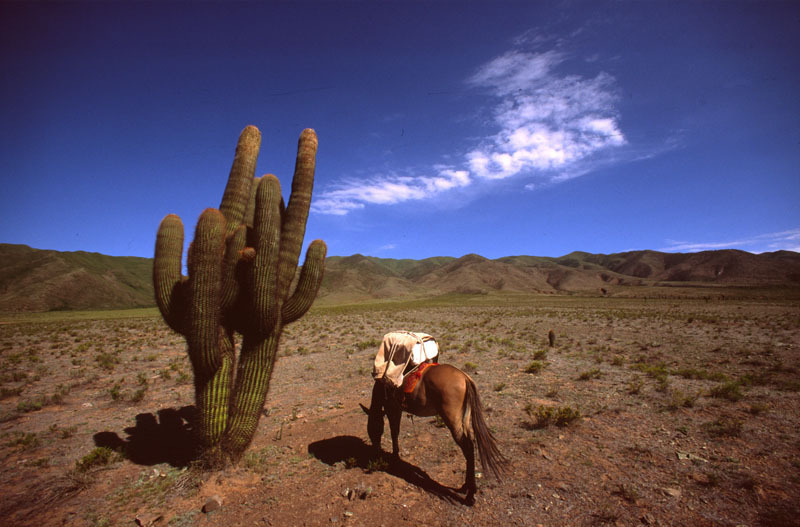 With the cactus standing upright it's just, well, a cactus. The vignetting of the original, cropped from the "corrected" image, also served to contain the eye on the main subjects. So since you asked, in my opinion this is one image that was not particularly well served by the "tech stuff". I started doing stuff like this a lot recently, it just makes stuff look more comfortable to my eye. I use a 28mm prime on a digital sensor.. there is a tiny bit of barrel distortion..
then I correct for perspective using the CROP tool, there is a checkbox button in the CS2 I am using that allows the same functionality as the free transform seems to, but as a crop..
'perspective' at the top when using the crop tool.. Thanks for your opinions guys. I think you should lighten up a little, though. I didn't post this to get a picture on this blog or to get a good review about it or the mechanics to do it. I just posted it to share something I considered interesting. Is it just me or is the perspective in the "corrected| pic square, but not "straight"? I think it doesn't look natural, at least not more than the first one. I guess perspective is in the eye of the beholder. Very tricky tool to use, and unless some lines are involved - I refer using the right distance and camera height+level instead of getting the lines straight in post-ed. You're right Sdumai, some lines don't look natural. But there are physical limitations to this, the same as using a pc lens or a view camera. For example, if you shoot the face of a building with protruding balconies from ground level (the only way unless you're shooting from a helicopter), in your picture you'll see the bottom face of the balconies. When correcting perspective, you'll get things on the plane of the building's face straight and square, but the balconies will still show their bottom, as if pointing upwards. The only subject on which perspective correction works perfectly is an absolutely flat subject. And in reality those are not the majority. As you said, you look at it, try and see if you like what you get.